The original Asia members follow up on the reunion work, Phoenix, with the nearly similar Omega. Standing as a bookend to to Alpha, this is not Asia's swan song. Much of of what I said in my review of Phoenix applies here, specifically the second paragraph. Omega is the milder melodic rock of retirement age men, rather than the grandiose and bombastic arena rock of a younger supergroup. Neither neutered, nor in need of Viagra, Omega still approaches geriatric melodic. While every song here is very good, well-composed and performed, the music is generally soft. Nevertheless, there seems to be a slight return to more progressive nuances as Holy War, End of the World, and There Was a Time prove. This is a welcome advance over the previous outing. Conversely, where Asia has tripped is in the album cover art; it's simply ghastly. Overall, though more soothing than explosive like early Asia works, Omega is genuinely entertaining album oriented, melodic rock by masterful musicians. Recommended. 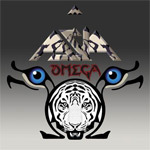 Though more soothing than explosive like early Asia works, Omega is genuinely entertaining album oriented, melodic rock by masterful musicians.